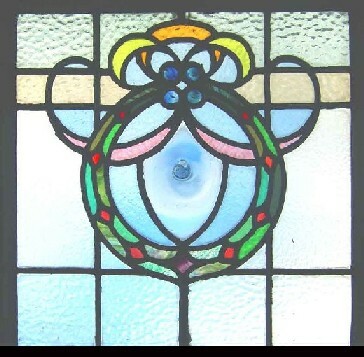 This Pair of Beautiful stain glass Windows have outlived their original frames and have been re-housed in pine frames for display.This glass is of a particularly high quality. They are of English origin from around the 1902 mark. Removed from a property in Lancashire. The coloured glass of this window has a rich deep texture. The rondels are Huge Rare and beautiful a very delicate Blue. The glass has no chips or cracks and the leading is in good order. Price is for the pair.. Each window measures 21 1/2" W x 20 1/2"H Glass 19 x 18 This Antique Window Shipped and packed to USA for $149 You can buy this now using the Paypal link below the photograph or e-mail sales click here to arrange payment by personal check ,money order or bank transfer.